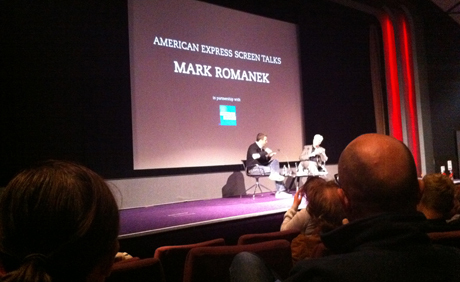 I went to the Mark Romanek ‘Screen Talk’ (AMERICAN EXPRESS AMERICAN EXPRESS AMERICAN EXPRESS AMERICAN EXPRESS) the other night at the BFI and it was surprisingly spot on. Often these kind of events get bogged down in either the director’s massive back catalogue of work or the awful questions from the more sycophantic members of the audience, but this was a rare success. Informative, engaging and occasionally funny, Romanek was disarmingly modest throughout but also willing to express his satisfaction with his best work. And his elbow patches were a treat. All in all, it was literally not boring. Tickets are still available for a few of the other Screen Talks (or ‘Masterclasses’ – I don’t really understand the difference), which you can read about here. They are totally worth checking out. And while we’re on the subject, if you don’t already own his Work of Director DVD, consider your collection incomplete.